Happy sunny spring day, E! 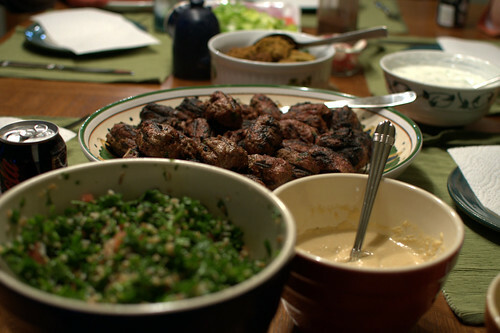 In an effort to continue to work through the meat in the freezer, last week we decided on kefta kabobs as the main dish. I planned on serving tabbouleh, yogurt sauce, vegetables, and flatbread with the kefta kabobs -- then N requested falafel and offered to make hummus. There was going to be five of us at dinner, so it was good to have more food! 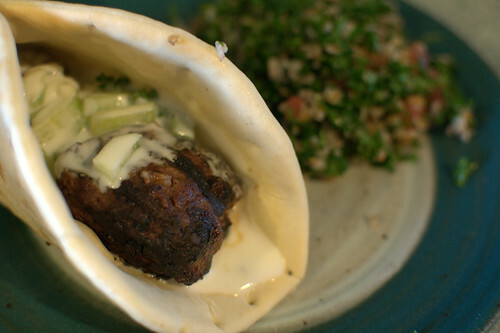 The recipe actually suggests adding breadcrumbs to help bind the kefta but I skipped that part. The allspice was an addition suggested by N. N grilled them quickly and they turned out fairly well! I think they could have used a bit more spice. I love tabbouleh, but find that a lot of places make it with too much bulgur wheat or too much garlic. Tabbouleh is supposed to be a palete cleanser and to freshen you up between all of the tasty, garlicy food. I found that this recipe has good proportions. I really love the fresh taste of tabbouleh! I also made a tzatziki-inspired yogurt sauce with some homemade yogurt and flatbread (aka Greek pita). The flatbread was a bit of a disappointment because it got hard so fast. N thinks that it does not need to be reheated in the pan before serving. It's really just a vehicle for the kefta anyway! 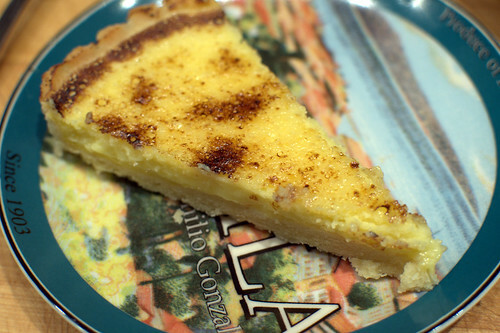 How long did it take you to decide on the Lemon Marscapone Tart from Almost Bourdain (recipe adapted from Giorgio Locatelli's Made in Italy Food & Stories)? 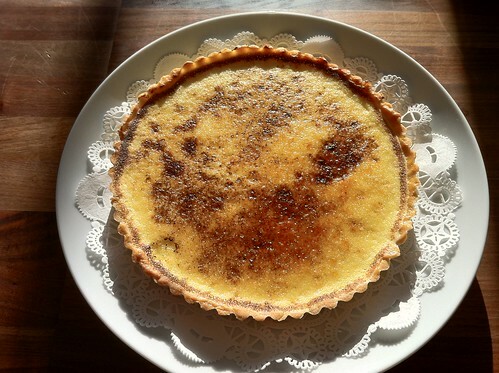 It was a wonderful choice and I loved the tart [so did Chester]. Thank you -- it was perfect! With the four of us and your coworker D , we had five players for games. 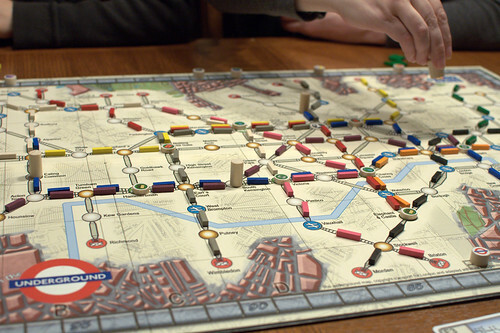 Unfortunately we do not have many 5 or more person games, so we ended up playing On the Underground (BGG). I think I am the only person who likes graph / route building games! I got a little lucky this game and eked out a win, but it's less fun to win when other people are not having fun playing the game. 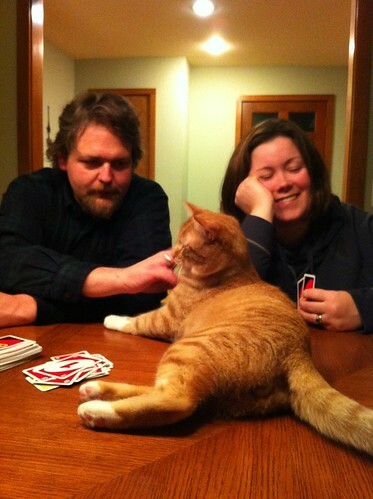 I guess I need more 5+ person games! Hi J - I often wonder if other people thinks we are ... crazy ... when we launch into very particular topics - such as which shape of Missions Tortilla chips taste better. D brought triangle chips, along with fixings for guacamole, and we immediately chuckled that utoh-chuckle, and offered our opinions, including how humidity in Texas in August affects the chips (not us, G!). Anyways, your beef bones was turned into Cuban Oxtail Stew, minus potatoes. I opted for corn bread. 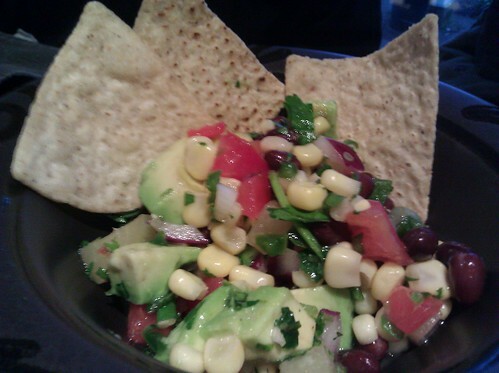 And paired with Black Bean salad, a mixed up recipe primarily based on this version from Guy Fieri and this Simply Recipe. It was a bit sweet, I should have fixed it with more jalapenos. Most of the Cuban oxtail stew recipes are a variation of this one. I made it a few days ahead, cool and reheated. Your grass fed beef is very lean and there was no fat to be skimmed. 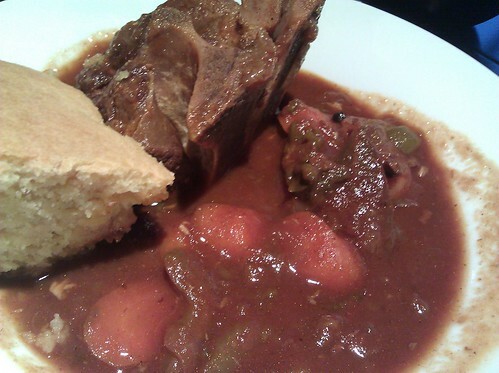 The stew was good, with a nice texture, thanks to the marrow. While cooking and reheating, it had a strong bell pepper and celery aroma, but not overpowering when I tasted it. Phew! G liked the marrow so much he went back to the pot for more bones. Minus N, plus D = 4 people so our game options was good. You suggested Puerto Rico. I thought D did a good job summarizing and explaining the game (sheesh, don't tell N and G), even thought he discovered he stated a rule wrongly towards the end of the game. Must. Pay. More. Attention. This second tine around, I focused on the coffee roaster route, got a couple of quarries, and felt like I did a little better than last time. 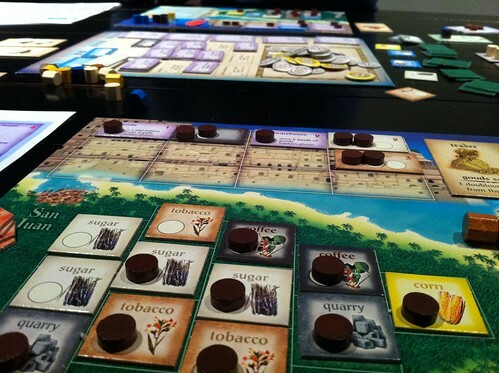 I like Puerto Rico a lot, especially the Governor rotation, it puts a spin on each round, without the randomness of dice roll. 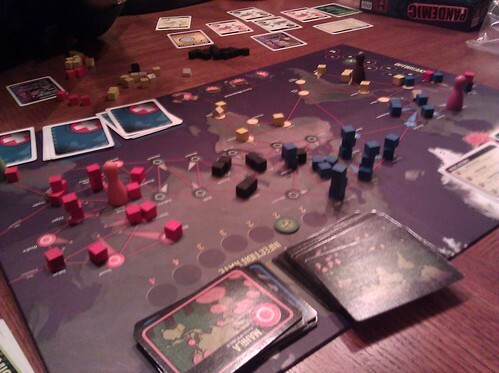 The game requires a lot-of-keep-track-of, but not overwhelming. Like! I apologize for taking so long to write this up! Why have things been so busy lately? A few weeks ago it was our turn to host and I dug in the freezer to pick out some meat and came up with a part of the quarter cow labelled, "carne asada." I was a little confused because as far as I know, carne asada isn't a cut, it's a preparation. 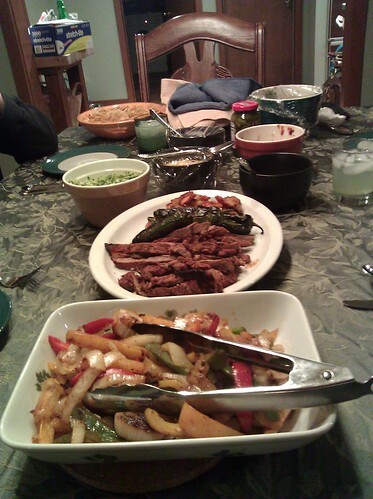 I shrugged, defrosted it and decided that we would have fajitas. At this point N took over the meat. 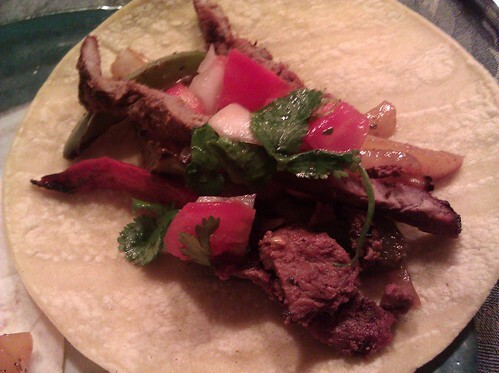 I had planned to use Tyler Florence's beef fajita marinade that I've made in the past. Instead, N did his own thing and marinated the beef over night in orange juice, garlic and cumin. A few hours before grilling, he added some more spices and cilantro to the beef and let it sit. He grilled it in the egg quickly using mesquite wood, which gave it a nice flavor. I guess mesquite is good for quick grilled items. I found the steak a little sweet. I think maybe it marinated too long in the orange juice or it just needed to be cut with a more sour citrus. I did like the mesquite smoke flavor, however. I took it upon myself to prepare vegetables and shrimp for grilling as well. I tossed bell pepper and onion with some fajita seasoning (I'm a cheater!) and a bit of olive oil. 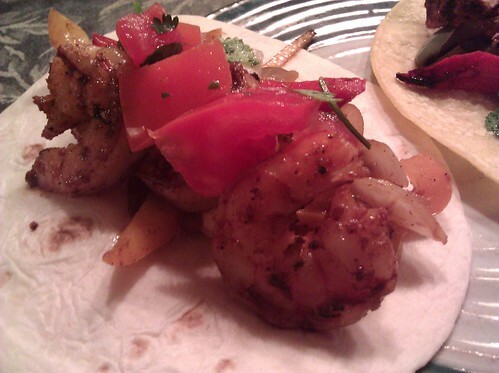 I tossed the shrimp with lime juice, minced garlic, fajita seasoning, and a touch of olive oil. 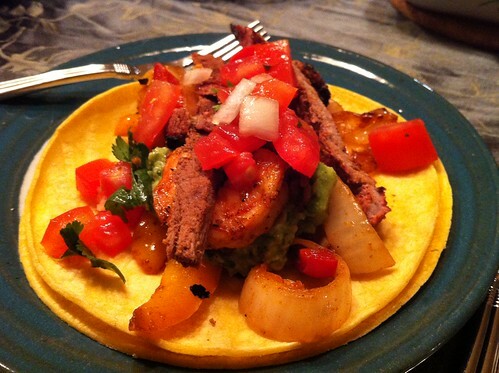 I liked the shrimp fajita, but I think I always prefer seafood! In addition to fajitas, we enjoyed your guacamole. Yum! I sure don't want us running the CDC anytime soon.